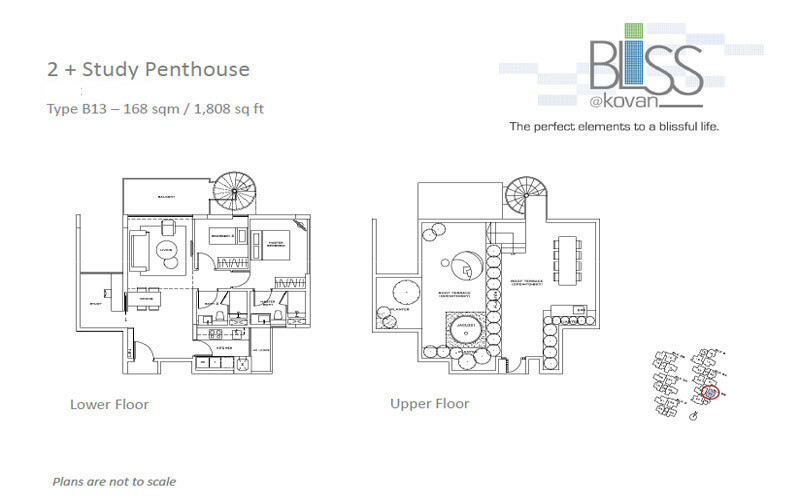 Bliss @ Kovan is one of the the newer Kovan Condo that has obtained its Temporary Occupation Permit (TOP granted in End 2015). This low-rise 5-Storey freehold condo comprises of only 140 exclusive elegant suites ranging from one bedroom to three bedroom. Sitting in the private enclave of landed residential developments, Bliss @ Kovan is surrounded by calmness and tranquility. The Bliss @ Kovan has received a BCA Green Mark Gold Plus Award for its environmentally sustainable design. Designed with several unique eco features such as High Level Trellis with Wind Deflector and Urban Farming Vertical Green Wall, Bliss @ Kovan boasts a stunning and contemporary architectural facade in the neighbourhood. Other than the standard facilities such as Dining Pavilion with Barbecue and Kitchen facilities and lap pool, communal recreation facilities such as Spa pool, Hydro Massage Pool, Biological Pond, Rain Garden with Integrated Bio-swale can also be found within the development. Despite nestled in a quiet corner of Kovan, Bliss @ Kovan is actually not more than 400m away from the underground Kovan MRT station. Enjoy the best of both worlds, indulge in the peacefulness and serenity within Bliss @ Kovan and yet have all amenities from dining, shopping and entertainment options just a few footsteps away. Eateries can also be found along Upper Serangoon Road, Heartland Mall, Kovan Food Centre and Hougang Central. Mega shopping mall, NEX and Serangoon MRT interchange (for both North East Line and Circle Line) is also just 1 MRT stop away. Bliss is also well connected to all parts of Singapore via expressways such as CTE, KPE and PIE. Nearby educational institutions include schools such as Xinghua Primary School, Xinmsn Primary School, Holy Innocents’ Primary School, Paya Lebar Methodist Girls School and Serangoon junior College.